By now, you're not only excited about the MST3K reboot, you're actually sick of hearing about it. Well, think about what poor Joel and Mike had to go through. Now, you don't feel so bad, do you? And now that I've cleverly maneuvered you into being in a good mood, let's put that to some good use. We know there will be some changes in the reboot of Mystery Science Theater 3000, but some things will remain pretty much the same. For example, there will have to be a bad movie to riff. Or, like they did from time to time, a TV show presented as a movie. 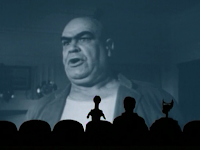 Which brings us to our MST3K Question of the Day: What should be the first movie/TV show riffed on the new MST3K? You're smart enough, you're good enough, and doggone it, people like your answers. Share with us, won't you? I know, we all hate it. You know, right? The incredible Melting Man, starring Alex Rebar. ...The Day the Earth Stood Still (remake). I imagine RiffTrax or Cinematic Titanic has done it already, but: ID4. I'd like to see a riff of "Truth", but it would have to be done by people who make fun of the differences between the movie and what actually happened. MST3K & RiffTrax mostly just riff on the movie's internal flaws, so they probably wouldn't be the right vehicle for such an endeavor. They never actually got around to one of my favorite horrible movies, Star Crash a low-budget, overt ripoff of several space operas featuring Caroline Munro in some unlikely outfits and a reluctant-looking Christopher Plummer. The Star Wars prequels. Any of them. For Mike and Jimmy, did you know that your wish has already been granted? Bad Movies to laugh at? After that, just draw the curtain, their work will be done. Spacehunter: Adventures in the Forbidden Zone. A fun film that's rich with riffable material. Turkish Star Wars (Dünyayı Kurtaran Adam). Virtually indescribable and violates so many copyrights.